We can learn from books...even forgotten ones! Occasionally it can fun to take a punt on an ‘unknown’ book, from a public library, charity shop or friend’s shelf, but when such a lottery yields an unexpected pearl it can be all the more rewarding. 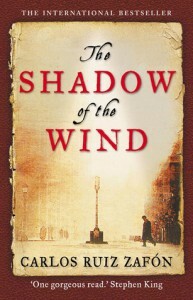 ‘The Shadow of the Wind’ was one such absorbing read, by an author (Carlos Ruiz Zafόn) unfamiliar to me, but this story is made all the more intriguing by its draw on several genres. Set in post-civil war Barcelona, there are elements of historical drama, echoes of gothic mystery and romance, thriller and even comedic moments. It’s a heady cocktail, yet the layering of the narrative is so expertly written that the reader is skilfully drawn into the complex lives of the interconnected characters. Central among them is Daniel, who, aged ten, is introduced to the strange ‘Cemetery of Forgotten Books’, where he is fated to choose ‘The Shadow of the Wind’ written by Julian Carax. “…few things leave a deeper mark on a reader than the first book that finds its way into his heart…”and so it proves for Daniel, as his ownership of the rare book triggers his curiosity about the mysterious author and burgeons into an ardent adult need to solve the puzzle that is Carax. Along the way, Daniel’s relationships with his father, friends, neighbours and those close to Carax offer vivid insight into the dark days of Franco’s Spain. None more so than a vagrant, the ebullient Fermin Romero de Torres, who befriends Daniel and though exposing him to the unwanted attention of his former police torturer (Inspector Fumero), also protects Daniel and infuses him with a romantic verve for life. By contrast, a rather sinister character disfigured by fire is also lurking, bent on relieving Daniel of his book. Peril it seems is never far away. Still, notwithstanding the well-defined Spanish social strata and the distribution of power across wealth, family and state lines, Daniel navigates a courageous path, which challenges the status quo and unashamedly asserts the capacity of love to breach such man-made boundaries. The various strands of the plot are woven together seamlessly to create a highly satisfying whole and Zafόn’s attention to the detail of his creation ensures there are no ‘loose ends’, which I rather liked. All in all a very entertaining read, though as Mr Carax suggests, “Books are mirrors: you only see in them what you already have inside you.” I hope not. As an aside, this novel was translated into English by Lucia Graves, daughter of Robert Graves, whose books about Emperor Claudius are among my earlier reviews. However, we should acknowledge that the quality of Ms Graves work has ensured that this novel seems to lose little in translation.